Dr. Kusek stands out as a leader in dentistry and uses the latest in dental techniques and technology to provide his patient’s with a beautiful and healthy smile. He holds distinctions as Diplomate of American Board of Oral Implantology, Fellow of American Academy of Implant Dentistry, Mastership in Academy of General Dentistry and Academy of Laser Dentistry. Additionally, Dr. Kusek lectures nationally and internationally on implants and laser dentistry. 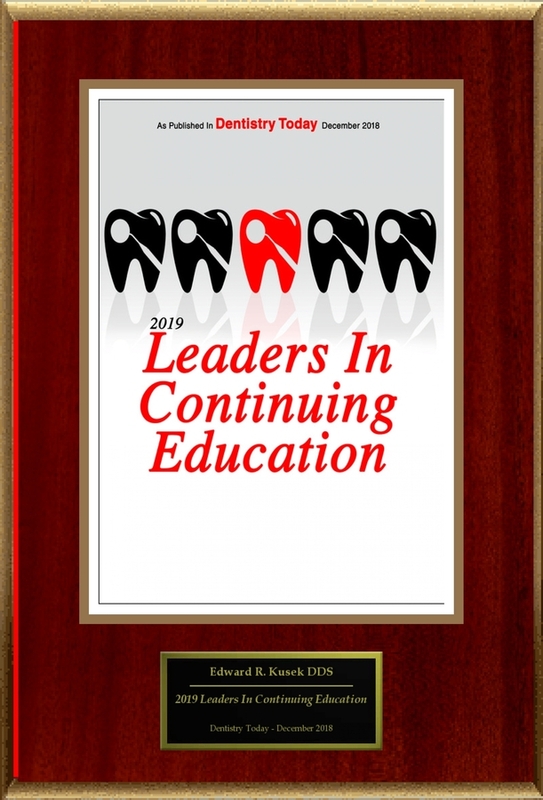 He was recognized as one of the “Leaders in Continuing Education” by Dentistry Today for third year in a row and was recognized as one of Americas Best Dentists for fourth year in a row. Following the publication of Edward Kusek’s selection for Dentistry Today’s 2019 Leaders In Continuing Education list, American Registry seconded the honor and added Edward Kusek to the “Registry of Business Excellence™”. An exclusive recognition plaque, shown here, has been designed to commemorate this honor. For more information on Edward Kusek, located in Sioux Falls , SD please call 605-371-3443, or visit https://www.drkusek.com. This press release was written by American Registry, LLC with contributions from Edward Kusek on behalf of Edward Kusek. American Registry, LLC is an independent company that serves businesses and professionals such as Edward Kusek who have been recognized for excellence. American Registry offers news releases, plaques and The Registry™, an online listing of over 2 million significant business and professional recognitions. Search The Registry™ at http://www.americanregistry.com. Edward Kusek Selected For “2019 Leaders In Continuing Education”.